Been itching to use that sheet of scrapbook paper but feel bad because you want to make sure you use it for something special? What about those of you who want an easy DIY to make presents for your friends? 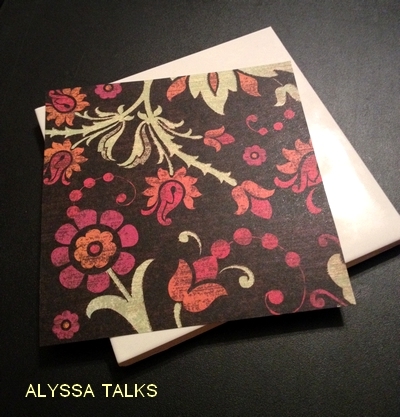 Then do I have the thing for you: DIY scrapbook paper coasters. 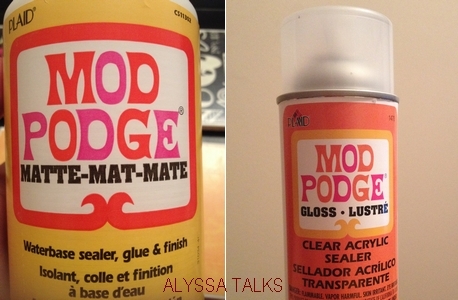 Here, you can see what the Mod Podge bottles look like. Make sure you’re buying the right stuff. They can be purchased at Walmart, Hobby Lobby, Michael’s, and probably even Target. Measure your paper to fit almost entirely onto the top of the tile. I’d leave like 1/8″ max of the tile showing, otherwise it’ll look weird. Believe me, the first ones I made had too much white around the side and looked weird. Cut your black foam into small squares (about the size of a quarter) as seen in the photo below. Place one in each corner of the tile. Using your sponge brush, coat your tile with a layer of the Mod Podge glue. You want the layer to be thick enough to hold the paper but not too thick that it’ll be a gloppy pile of glue. Slowly place your scrapbook paper sheet on top and press down to smooth the paper, using your fingers to remove any air bubbles that may be under it. 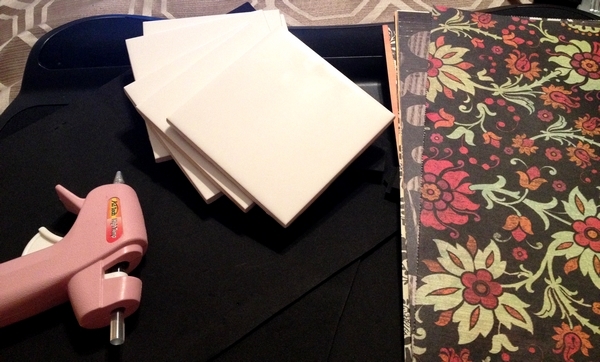 Add another layer of Mod Podge to the entire top of the tile. Try to use one direction with the glue strokes. It’ll look kinda weird unless it’s all going in one direction. Let the layer dry. Repeat step three 2-3 more times. You want it to completely cover the scrapbook paper and make a reasonably thick layer. 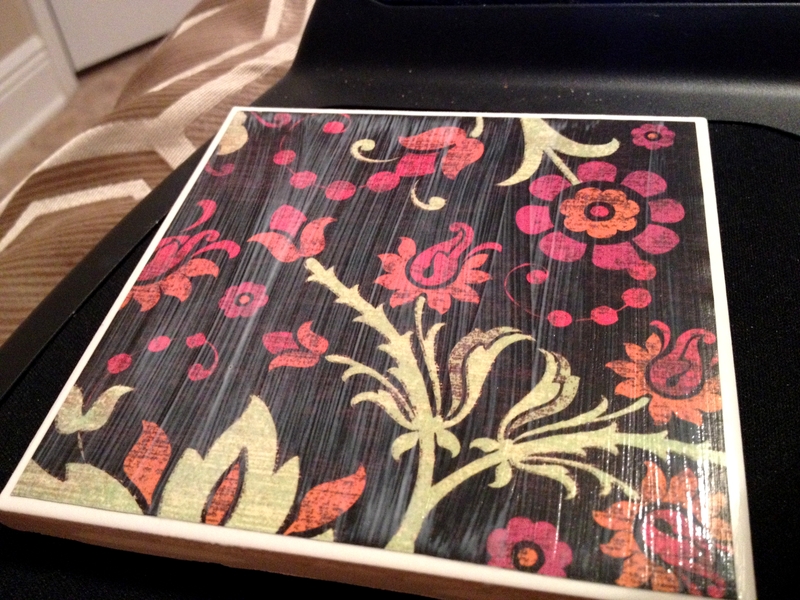 Once you have 3-4 layers of Mod Podge glue on your coaster, you’re ready to use your Mod Podge sealer. The sealer will seal whatever surface you spray your tiles on, so spray them on top of some cardboard in the garage or in the yard. Spray one layer every fifteen-thirty minutes about three times. You again want this layer to be thick. 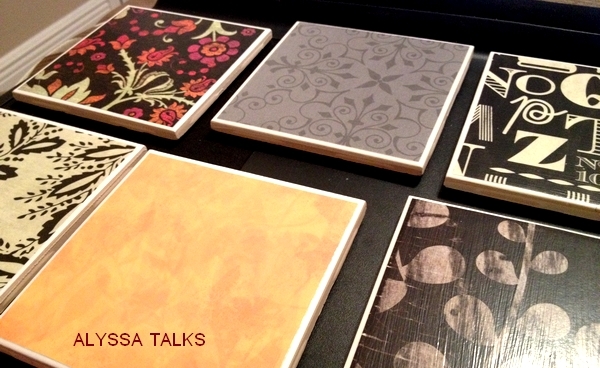 After you’re finished with your third later of sealer, your tile will be shiny and glossy. Make sure though that you give it time to dry completely before you start using it as a coaster. I usually give it at least 24 hours before putting a cup on it.